Remember the classic prank phone call, “Is your refrigerator running?” Today’s version would be, “Is your website running?” Only the comeback to a reply of “yes” wouldn’t be, “You’d better catch it then!” It would be more like, “Do you know how WELL it’s running?” Your site may appear to be humming along, but if you don’t attend to essential website maintenance tasks, it could be quietly falling apart behind the scenes. Learning what to check and when can make a big difference in your website’s speed, ease-of-use, conversion rates and ranking – not to mention security. Start 2019 right by making sure your site is in top condition to generate maximum sales for your business! Your website isn’t the Mona Lisa – a work of art to stand back from and admire once it’s built. It should be a dynamic environment that adapts to changing conditions. WordPress deserves specific maintenance advice. Templatic – seller of premium WordPress themes – has a great deal to say about updating the software – including the major components: theme, WordPress and plugins. Most of the plugins and themes can be easily updated from the dashboard with just a click. WordPress, too, can be updated with only a button click. The downsides of not updating on a regular basis include the possibility of missing out on an important security patch, missing important fixes in the features or even missing new features entirely. Basically, GDPR affects any business that has customers located in the EU. There is no restriction based on location, company size or scope of business – meaning any entity with an internet presence could be affected and hit with a heavy fine if it isn’t careful. Facebook and Google have been accused of privacy violations, which indicates that enforcement is being taken seriously. Back to Facebook, its numerous recent data breaches likewise reinforce the need to make sure your website complies with current security measures and updates. You lose more than user data if your website is hacked – you also lose your company’s reputation and credibility while exposing users to identity theft and other types of cybercrime that can negatively impact them for many years. When suspicious activities are observed, instantly notify all of your website users if there is a possibility that their data could be – or has been – exposed. Get help from a security platform, such as Sucuri. 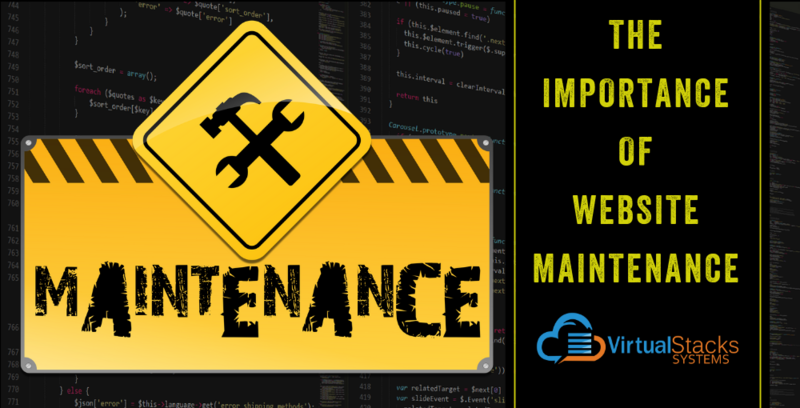 Establishing a website maintenance schedule and sticking to it will not only make sure your website is running perfectly, but that it will run circles around those of your competitors! And if you’d rather leave this sort of work to the pros, Virtual Stacks Systems offers website design, website redesign and regular maintenance – as well as many other services. Contact us to learn more.